Samsung has shown off two 3G HSDPA enabled smartphones at 3GSM in Barcelona - the Symbian S60 equipped SGH-i520 and the Windows Mobile SGH-i600. The SGH-i520 is a slider phone that's just 17.9mm thin and weighs 99g. As well as 3G multimedia functionality, including video calling, it has multi-format music player, and features a 2-megapixel camera and full HTML browser. It use Symbian OS Version 9.2 (S60 3rd Edition) and its HSDPA max data speed is 1.8Mbps. 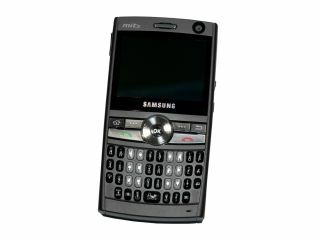 The Ultra Messaging SGH-i600 is a Qwerty keyboard equipped Windows Mobile device (the slimmest smartphone of its kind at 11.8mm thin). It supports Wi-Fi as well as HSDPA 3G broadband data at 1.8Mbps. Messaging is naturally its strong point, with a well-spaced keypad and support for push email. The usual spread of Windows Mobile 5.0 for Smartphone applications are included, and multimedia functionality includes video calling and a Windows Media player. The i520 is due for release in the second quarter of this year, while the i600 is already available in some European countries.